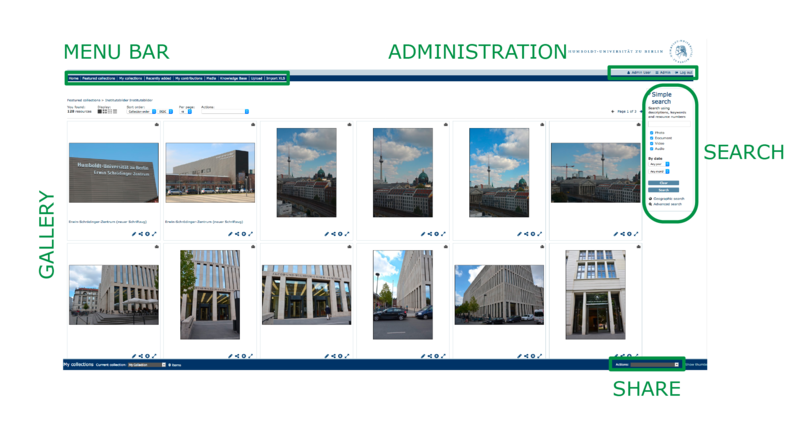 This server hosts the Media Repository, provided by the CMS of the HU-Berlin. Currently, it is in a beta phase. What is the Media Repository? The Media Repository allows me to store, manage, organize and share my media data. Public web presentations are possible as well as collaborative work in restricted groups. The Media Repository helps both small teams and larger research projects in the management of media assets and their long-term storage. The Media Repository is powered by the web-based Digital Asset Management System ResourceSpace. On the website of the service and on re3data.org you can get more information. I want my own space right now with this order form . After the login with the HU-Account I get to my private area. I can upload resources here and group them into collections. I can share my objects with my colleagues or embed them into different web pages. I can decide what other user are allowed to do with my data. The Media Repository contains at the moment 182 projects. 125 require additional access rights (icon ). 39 projects with public content are marked with this icon . Additionally, 18 projects without login contain no public available resources (icon ).